It’s not hard to find carspotters armed with cameras chasing after Bugattis and Paganis on the streets of London or Monaco when the weather gets warm. But this might be the single wildest street discovery in years. If you recognize this car without having to Google it, I applaud you. This thing is rare. You’re looking at the SARD MC8. As in the one. Just one. That’s all the world has. It’s an MR2 with a twin-turbo 1UZ V8 (made famous in the Lexus LS400), built by Toyota’s factory racing team SARD in the 1990s with the aims of competing in GT1. This is basically like Toyota’s version of the Lotus Elise GT1, or the Porsche 911 GT1 if I wanted to be slightly less obtuse. Toyota built a handful of these things for racing, and while they supposedly made a good 600 horsepower, they really struggled on track in 1995 and 1996, not qualifying at one point, catching fire another. 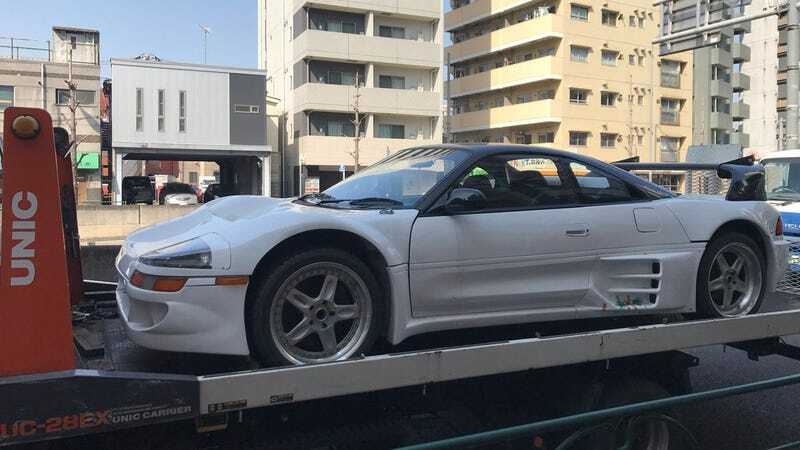 This one homologation special road car apparently disappeared not long after it was built, then showed up on a Japanese for sale site in 2015 as our friends at Road and Track pointed out. “The holy grail has been found,” one MR2 forum put it when the road car emerged from hiding. It’s now presumably in the hands of an extremely lucky private owner. It’s one of the wildest cars Toyota ever had a hand in, a very interesting could have been. Seeing one on the street, as spotted by kaiAE86, must have been enough to stop your heart.